Customers 1st: Are you effectively measuring, aligning and communicating your customer strategy? Are you effectively measuring, aligning and communicating your customer strategy? Are you looking for ways to revolutionize your customer experience? 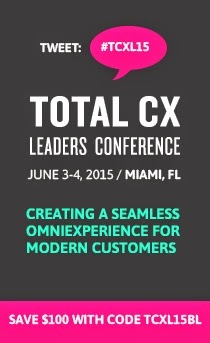 The Total Customer Experience Leaders Summit is only ONE month away - don't worry, there's still time to secure your spot and save $100 off the standard rates! 1. A Who le New Focus: Growing out of our past Linkage Strategies Event, Total Customer Experience Leaders is about integrating the voice of the customer into disparate pieces of customer research data within B2B and service oriented B2C companies. 2. Innovative Keynotes: Hear from client-side experts and award winning authors on creating customer-centric culture, the practice of storytelling, leveraging senior leadership and discovering authentic experiences. 3. Cross-Industry Speakers: Listen to a diverse group of leaders share industry specific case studies which include experiences from financial services, automotive, manufacturing, retail, healthcare and industrial companies. 4. Social Media CRM Symposium: Join our symposium day and learn how to better manage your customer experience by linking social media research to financial value. 5. Customizable Tracks: Personalize your onsite agenda by choosing between two unique tracks - Strategy & Action Planning. 6. Executive Summary: This is the only collaborative event that offers an event debrief with real-time practical insights for you to take back to your company. AAA // AAA Arizona // AIG American General // Allstate Financial // American Family Insurance // AT&T Investment Management Corp // Blueocean Market Intelligence // Burke Inc. // Concentra Financial // Constant Contact // CPI Card Group // Customer Bliss // Customer Experience Partners // CVS Caremark // Diebold, Inc. // Discover Financial // EMC Innovation Network // Expedia // Farmers Insurance Group // Fedex Corporation // Forrester // GE Healthcare // Harrahs // Intel // JD Powers & Associates // Kelley Blue Book // Loyalty Research Center // Maritz Research // Martins Point Health Care // McDonald's Corporation // Microsoft Corporation // Mr Randy Bell // National Grid // Peppers & Rogers Group // Petra Consulting Group // Pfizer // Rockwell Automation // Sam's Club // Sara Lee // SPSI // Strategic Horizons Llp // SuperValu Inc. // Synovate // The Story Factor // Universal American Corporation // University of Georgia - Terry College of Business // UPS // Wright Express Corp. The Total Customer Experience Leaders Summit will enable you to effectively measure, align and communicate your customer strategy to ensure business relevance. 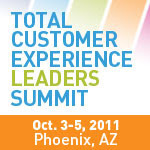 Please use priority code TCEL11BLOG when registering.